Mobile notary serving Orange County, California and surrounding regions. Certified and bonded in all notary services including Loan Signing. Available after hours and weekends with reasonable rates. The web server with the IP-address 184.168.221.38 used by Certifiedsigners.net is owned by GoDaddy.com, LLC and is located in Scottsdale, USA. There are many websites run by this web server. The operator uses this server for many hosting clients. In total there are at least 2,464 websites on this server. The language of these websites is mostly english. Only a few websites on this web server are x-rated. 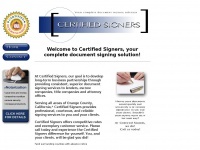 The websites of Certifiedsigners.net are hosted by a Microsoft-IIS server and were developed in the programming language ASP.NET. The HTML pages were created with the latest standard HTML 5. The website does not specify details about the inclusion of its content in search engines. For this reason the content will be included by search engines.